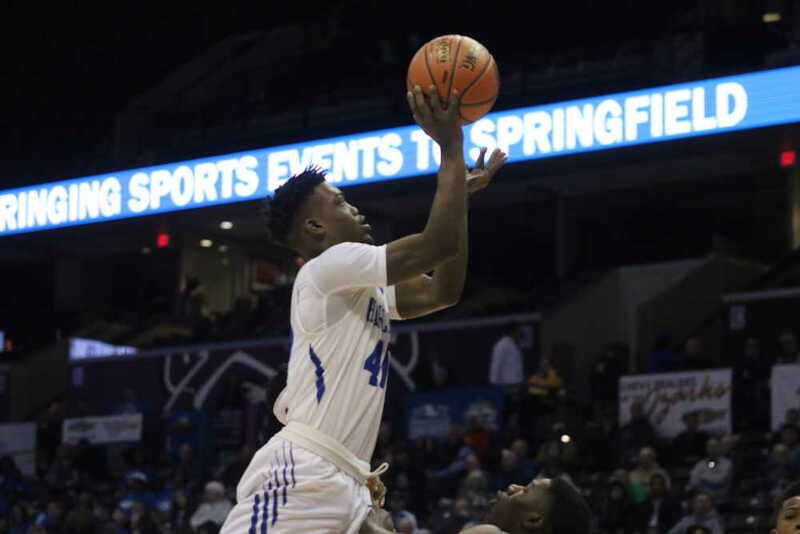 Charleston's Terridean Bogan (12) tries to shoot over the outstretched arm of Vashon's Mario McKinney (4), on Thursday, in the Class 3 Show-Me Showdown, at the JQH Arena, in Springfield, Mo. SPRINGFIELD, Mo. 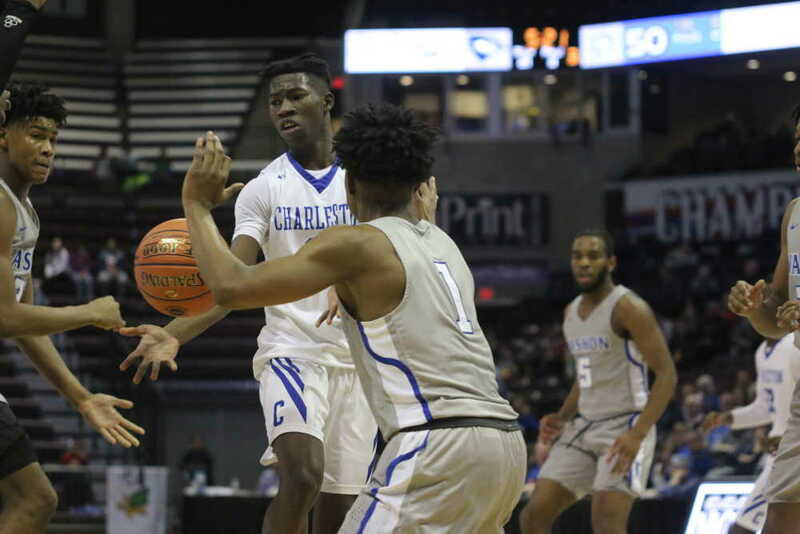 — Going into Thursday’s matchup with Vashon, the Charleston boys basketball team knew they had to play a near perfect basketball game to come away victorious. For one quarter, it looked like the Bluejays may spring off the upset. 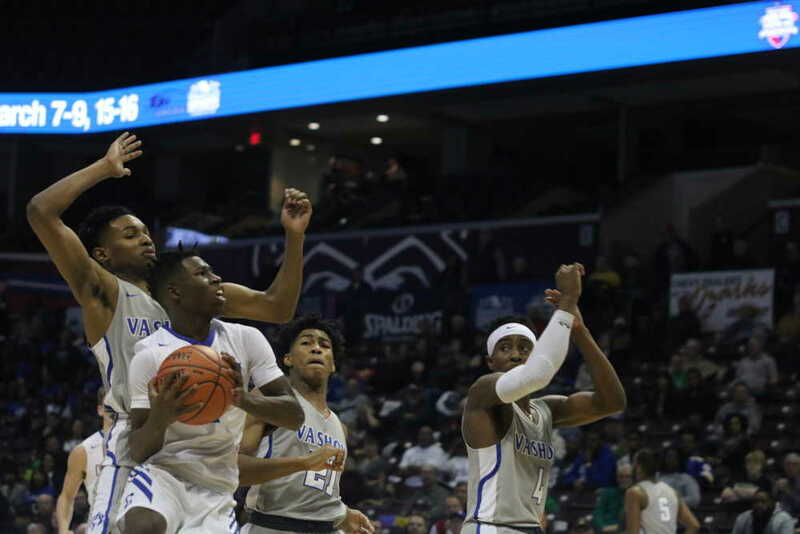 Vashon, though, had other plans, as they used a sluggish first quarter as fuel to a 70-47 win in the Show-Me Showdown Class 3 Semifinals, at the JQH Arena in Springfield, Mo. 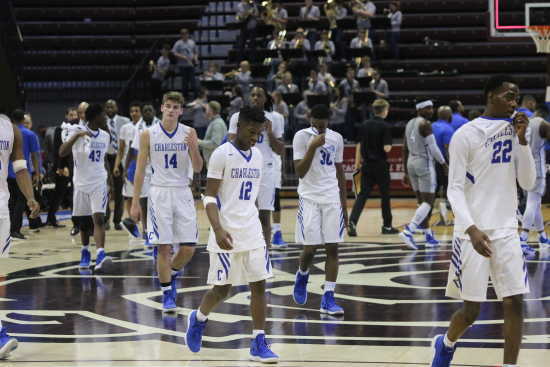 The Charleston Bluejays walk off the court after a 70-47 loss to Vashon, on Thursday, in the Class 3 Show-Me Showdown Semifinals, at the JQH Arena, in Springfield, Mo. 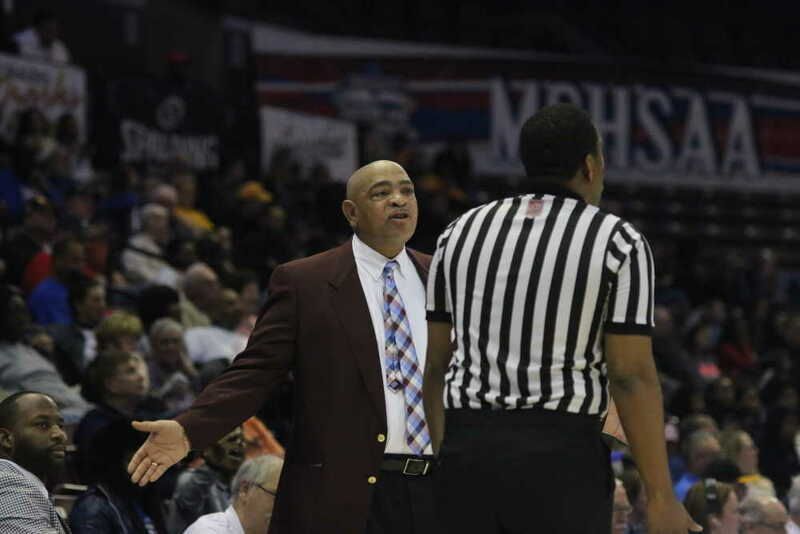 After leading 11-10 after the first period, Charleston’s second quarter was one that it would have liked to have back. Senior Mario McKinney paced the way for the Wolverines with seven points during that stretch. Junior Phillip Russell had six points, on a pair of 3-pointers, as well. He finished with 20 points, on 7 of 13 shooting, along with four rebounds, four assists, and three steals. 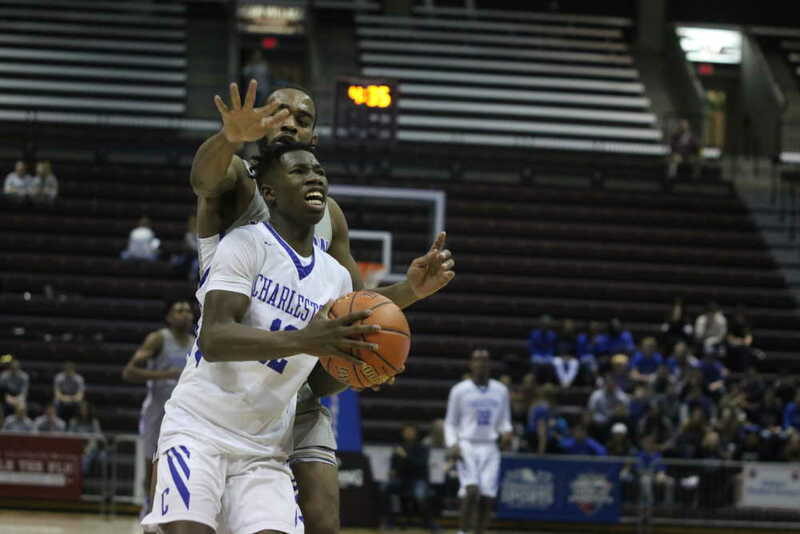 Breaking the run with 5:56 left before halftime, Charleston junior Terridean Bogan drew a foul and hit both of his free throw attempts to cut the Vashon lead to 21-13. A smooth-shooting left-hander, McKinney — a Missouri commit — finished with a game-high 26 points on 9 of 17 shooting and 3 of 7 from 3-point range. He also grabbed eight rebounds, dished out three assists, and was a force on the defensive end of the court, with five steals. After scoring six of his team’s 10 points in the first quarter, McKinney followed that up with a 16-point second frame that helped the Wolverines head into the locker room up 41-23. Charleston allowed 31 points in the second quarter. Going into halftime, McKinney said that his team was frustrated with how his team was playing, despite opening up an 18-point lead. 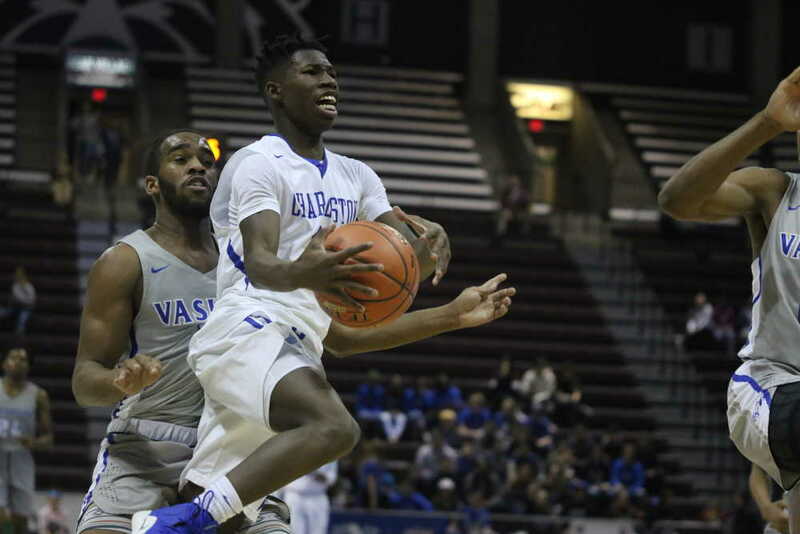 Vashon continued to put the pressure on Charleston (20-11) once the third quarter started. 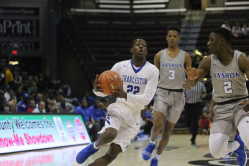 Senior Donyae McCaskill went on a personal 7-0 run once the second half started, pushing the Vashon lead out to 23, at 48-25. 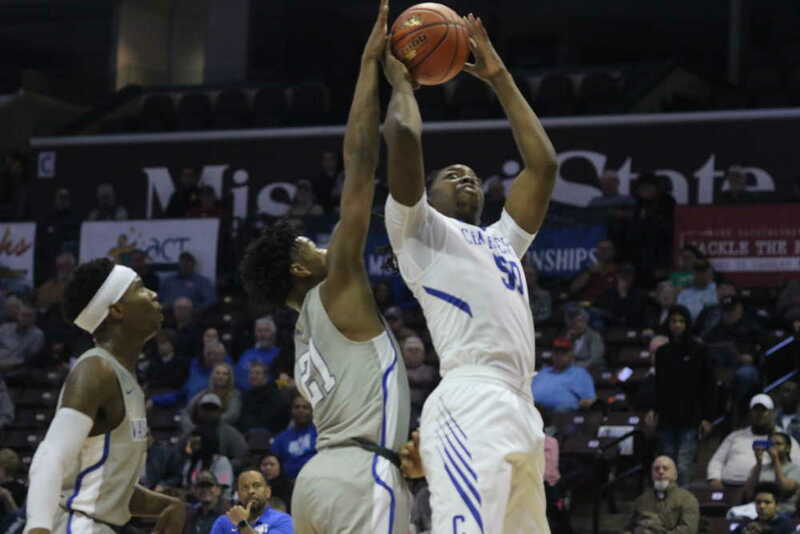 McCaskill finished with nine points, on 4 of 8 shooting, to go along with two rebounds, one assist, and one blocked shot in 25 minutes of action. Junior Blessin Kimble ended McCaskill’s run with a jumper to cut the lead to 21. Kimble finished with a team-high 17 points, on 7 of 11 shooting, with six rebounds, and two steals. 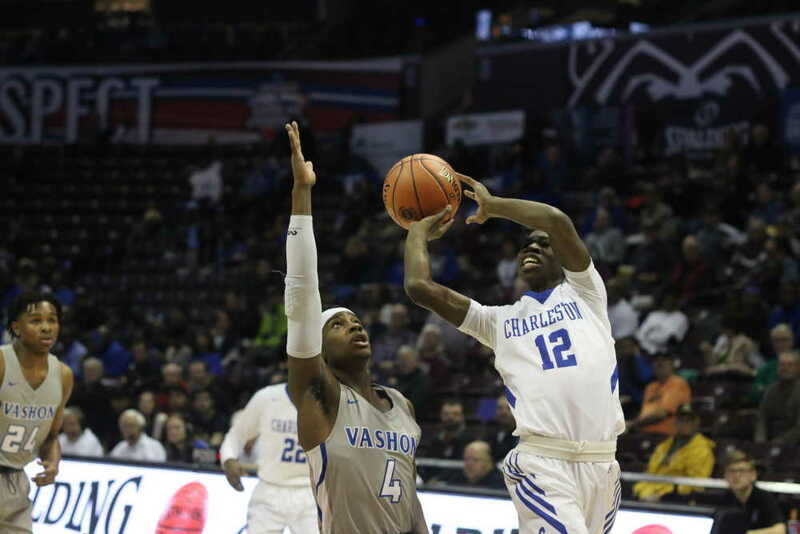 From the second quarter on, Charleston struggled to figure out the Vashon defense. The Bluejays finished with 23 turnovers, which Farmer said his team could not do, heading into the contest. 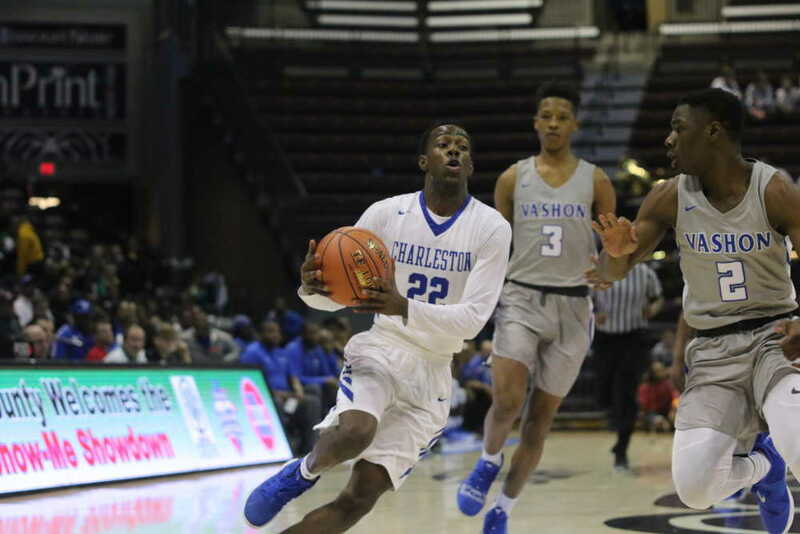 Athletic and quick from top-to-bottom, Vashon posed a threat from the beginning but more so in the second half, as the Wolverines made it hard for Charleston to find any rhythm from the floor. After shooting 6 of 14 (42) percent from the floor in the first half, Charleston shot 8 of 26 (30 percent) during the second half. 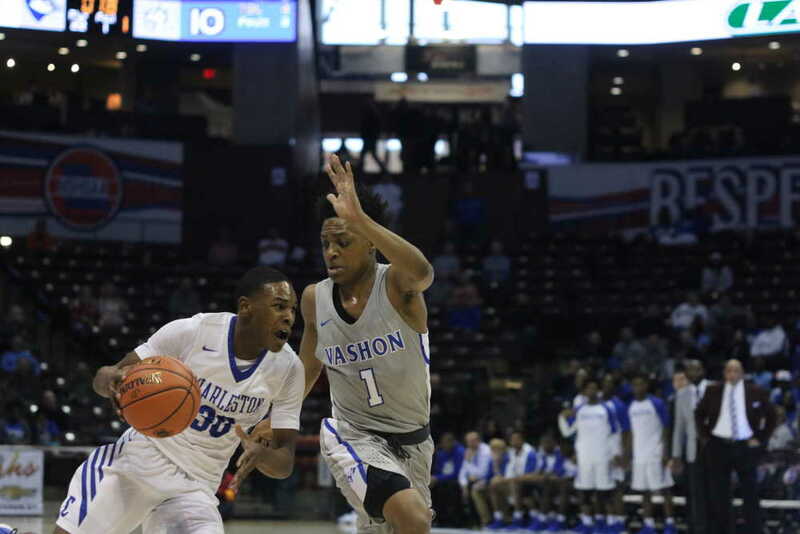 Simply put, quickness is what Charleston senior Latrell Porter said about Vashon’s defense and how it hurt their percentage. 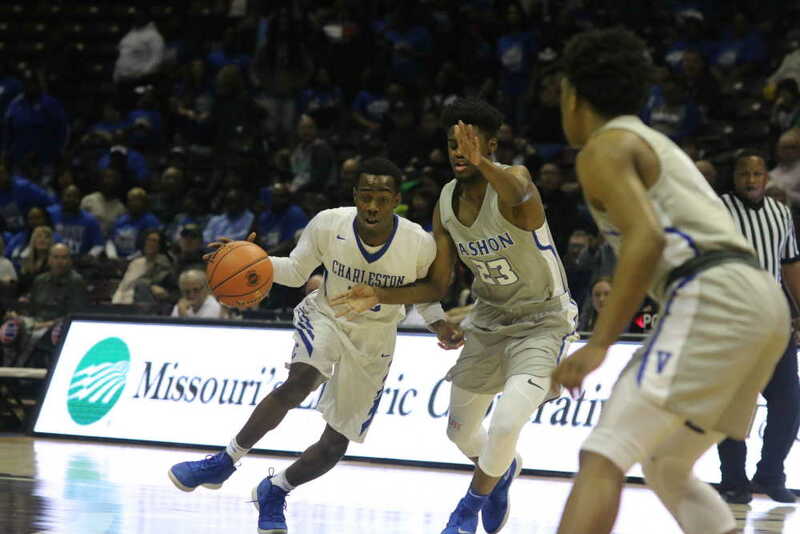 Charleston's Latrell Porter (22) tries to drive around Vashon's Chanze Cruesoe (2), on Thursday, in the Class 3 Show-Me Showdown, at the JQH Arena, in Springfield, Mo. 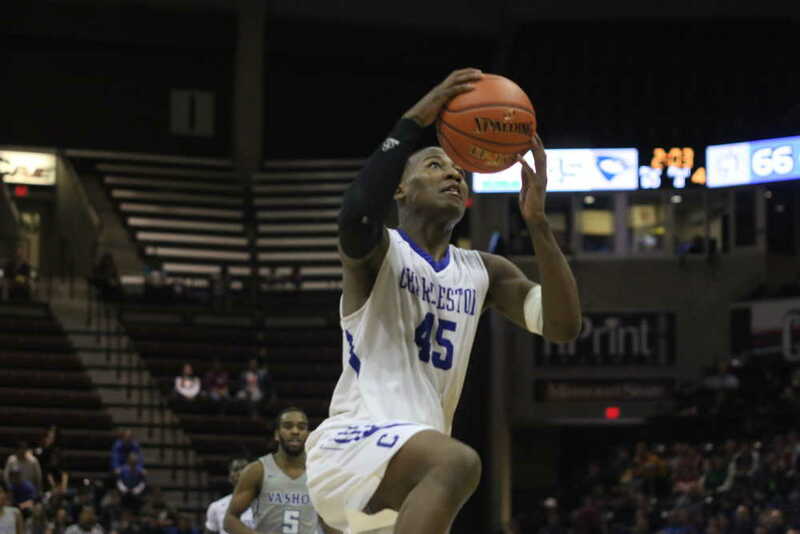 Bogan was the other Bluejay to reach double-figures in scoring, with 10 points. Even with a cold shooting night — 1 of 10 from the floor — Bogan made up for it with his aggressiveness. He shot 7 of 10 from the free throw line. 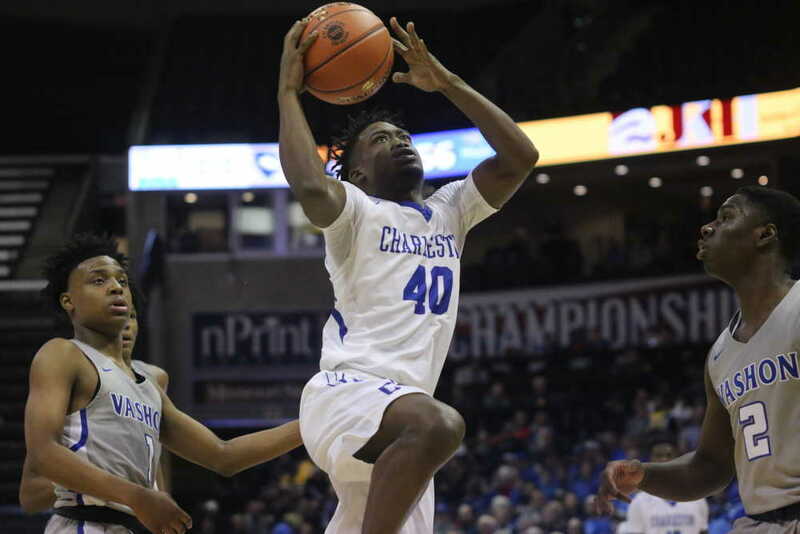 One takeaway that Farmer said he liked a lot was on the rebounding side, an area that has been a strength for Charleston the entire season. The Bluejays finished with 34 rebounds — tying the Wolverines in that category. Porter tied Kimble for the team lead, with six. Charleston plays St. Paul Lutheran, at 11 a.m., today, at the JQH Arena.